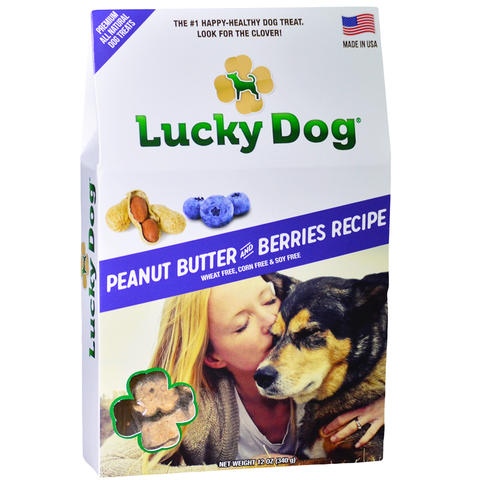 Creamy peanut butter, a hint of honey, and nutrient-packed fruit make Lucky Dog® Peanut Butter and Berries Treats the perfect daily snack. Serve as a reward or just to make a tail wag. Wheat, corn, and soy free - great for all size dogs. Made in the USA. I had bought a box of the peanut butter and blueberries box from Marshall’s dept store.I n very bought this for my dog before.I normally would just him his chicken jerky treats .So when I got home I gave him 2 of the cookies and he ate them up and Now this is his second favorite treats.I’m gonna buy some more of these treats for him.